I realised the other day I hadn't actually written that many reviews since my brief hiatus, and sitting in my to do pile are a load of older reviews I've yet to finish off. 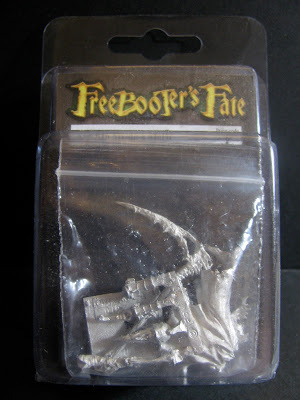 There are a few for Freebooter's Fate reviews that I want to do, so I'll try to get them finished this week. 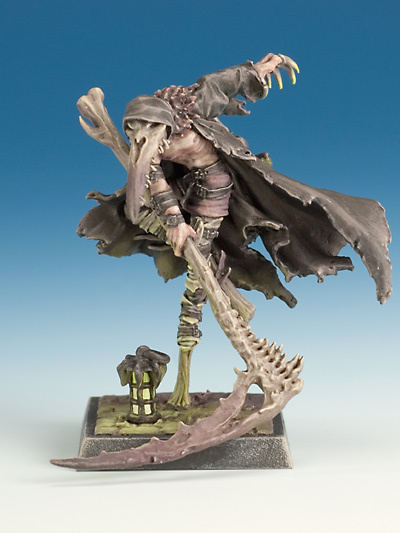 So I'll start with one of my favourite Freebooter's Fate miniatures, Miedo a Morir. Miedo a Morir is a single character for the Brotherhood faction in Freebooter's Fate... or he's just a sodding awesome painting challenge. He comes with both his German and English gaming cards, so my mission to brush up on my German using Freebooter's Fate continues apace... although I'm really not quite sure how knowing 'unterleib' is meant to help me in everyday conversation! Miedo comes with the usual sunken square plastic Freebooter's base and a metal scenic base insert, which is something I love about Freebooter's miniatures. The miniature itself comprises of 7 metal components, 4 of which come attached to a metal spru... sorry the technical term escapes me for now. Some of these pieces are quite small and fiddly so be careful when removing them, and when sticking him together. A better shot of the individual components. To the left of this text you will see the completed Miedo a Morir, who is an utterly splendid sculpt and wonderful miniature. He evokes such a strong sense of Rennaisance Venice and in particular the 'Carnevale di Venezia'. Yet his name is purely Spanish and mans fear of death I believe, although my Spanish is utterly dire. The mask he wears though is very reminiscent in shape of the 'plague doctors' masks from carnival time in venice, with it's big long hooked nose. Although it isn't as smooth and clinical as the plague doctor masks of Venice. It is more like the skull of some large carrion bird, with a beak. It's quite a grim looking mask, but it's roots are clearly from the Carnevale di Venezia. Much like the rest of the Brotherhood faction, who all seem to be carrying Venetian style masks around with them, and who all evoke a bit of the intrigue and assassination vibe that accompanies much of the imagery of that period. But the macabre air of Miedo concurs up the work of Tim Burton to an extent as well. I could image something similar making an appearance in one of his creations. The name though makes sense, as Miedo a Morir is very similar in shape as the Grim reaper. Large wicked looking scythe, again it looks like it's made out of rugged bone. The long swooping cape also concurs up images of death. But it is the emaciated looking torso, which like the his thin and wiry legs that look wrapped in straps of leather that give him his death like feel. He looks half dead himself, yet with that wicked looking bone scythe he looks more than capable of dispatching his foes to the land of the dead. The his feather topped cape whipping around his body adds a level of drama and motion to the piece. But, the biggest single defining feature is the fact that Miedo a Morir is walking on some short ramshackle and rotten looking stilts. I've put a photograph in of Miedo's torso without his head and scythe, it shows off quite neatly his precarious stance. I can imagine him scuttling down back like some alleys, like some hideous circus performer click clacking on cobbled streets as he nimbly uses his extended gait to speed after his quarry. 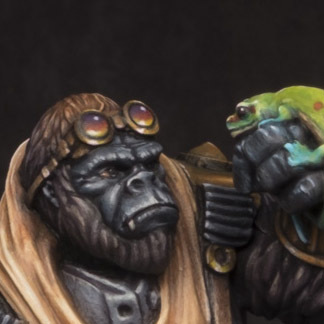 It is this feature more than any other that gives this piece it's unique character as a miniature, and it is a unique miniature. He has a very dark and grim air about him, yet his pose, with his scythe forward and exaggerated mask poking out forward he looks like so street performing acrobat. He is simply one of my favourite Freebooter's Fate miniatures. As you can see from the close up of his feathered / furry collar there is an awful lot of surface detail on this miniature. The boney mask that Miedo a Morir wears is a wonderfully pitted and organic looking surface, with lots of jagged little teeth on the underside. The wicked looking scythe he is carrying also looks like it is constructed out of the same pitted and organic looking bone, the head of the scythe is exceedingly detailed, and not just the blade. The back edge of the blade appears to have lots of vicious jagged looking teeth on it. I can imagine Miedo a Morir running maniacally down streets swinging that scythe back and forth in sweeping arc slicing and impaling in equal measure. All while his cloak is swishing and flowing with Werner's usual elan. It isn't a neat and pristine cape though, it is a tattered, torn and frayed garment. The edges of the cloak look like it has seen a little bit too much action. Every little section of this miniature has some form of fine detail, from the leather straps that wide around his torso and legs, with their tiny little buckles to the cobbled street base inserts itself. This miniature is full to the brim with clean crisp detail, not over flowing with it. Miedo a Morir is a very 'ambitious' miniature in many ways. The complexity of his composition while clearly being it's artistic strength is in fact also it's technical weakness. Werner loves his wildly dynamic and theatrical poses. I've often waxed lyrical in previous Freebooter's Fate reviews about some of Werner's clever 'cuts' that allow him to create such animation and motion in his pieces, well here it was a bit of a pain in the arse! Firstly you have the scythe, which is both delicate and heavy at the same time. The contact point for attaching it to the main body is also really small, and although the arm is trailed down the scythes haft, which allows a decent pin to be inserted for strength, the shoulder is then and does not. It's also at a really awkward angel and is difficult to align satisfactorily. Not an easy peice to attach at all, get it wrong and the composition looks all screwy. A close up of that left arm joint. Then there is the left arm that trails out behind Miedo, yep it looks great, but its a problematic component. It's actually the arm and his shoulders, a part that slices right across the top of the body. The contact point isn't smooth and flat either, it's curved and no uniform. Getting it to sit right wasn't possible. I could see that if the piece hadn't warped slightly during casting how it might sit flush, but mine would not. I chose to have it sitting leaving a slight gap under the left arm that wouldn't be too hard to rectify with green stuff, and leave a bigger gap around the fury / feathered collar, which I believe will be slightly easier to hide with green stuff. Not idea, but not a deal breaker either. The worst component though, and the one that makes me believe Werner might be a sadist is the lantern trailing off of the back of Miedo's left arm, which comes attached via a very thin leather strap. Nice! No chance to pin it, and using a super glue rapid cure there was a significant chance you'd end up with a nice big glob of glue. Arggghhhh. So I sat there wedging it in place with the point of a craft knife blade until the glue set. Now there's a way to spend a Sunday afternoon!!! that bloody lantern I was talking about! On the whole though the casting was good. There were more mould lines than I'd become accustomed too with Freebooter's Fate miniatures, but none of it was out of the norm for a metal miniature. True the high levels of surface detail that gets crammed onto a Freebooter's Fate miniature made cleaning those lines up more tricky, but that speaks to a positive. The level of surface detail retention on this miniature for the medium, metal, is exceptional. 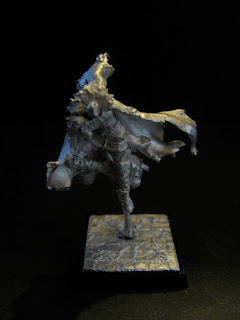 It's actually comparable to many top end resin cast miniatures I've seen from the likes of Studio McVey and Kingdom Death, sure it's not quite to the sharpness and crispness of their best efforts, but nevertheless it is highly impressive. as with most of the miniatures I've had for Freebooter's fate it's a good solid standard. The chaps at the Freebooter Miniatures stand were thoroughly nice fellows, and chatted to me at great length, not only about their games and products, but also other peoples product they'd seen and liked. As I said thoroughly nice fellows! I brought Miedo quite a while ago now, back at Salute 2012, he was part of some Freebooter's swag that that I picked up that day. As such I'm really not sure about what sort of money I paid for him. I think it must have been around £10. But, Freebooter's Miniatures have had to put their prices up since then, which considering they've kept them steady for nigh on 8 years is sodding impressive. So what price for Miedo a Morir now? Well at Firestorm Games you can pick him up for £10.80, supposedly £1.20 cheaper than the RRP. Maelstrom Games have it for retail at £10.79, but currently don't have him in stock, and with their rumoured troubles maybe it'd be wise to wait and see... or go elsewhere. Hell I even looked up the price for him on Waylands Games website, but they don't appear to stock him, and their Freebooter's Fate section is actually nonexistent really, as it's more a Freebooter's Miniatures section, which makes finding your miniature and faction of choice a little bit more time consuming. I'm sure they could order him in for you though. Thing is Miedo a Morir is one of the most awesome looking miniatures you're likely to see on a table top. He oozes character and at the prices quoted above he is a bargain. I love him! Here you can see the completed miniature as painted by Jen Haley, and splendid looking it is too! I'm pretty certain I'll not be reaching those dizzying heights in brush work, but hopefully her paint job shows you all just what a truly splendid looking miniature it really is. From the tattered cloak, to the gaunt and emaciated ribcage. Miedo a Morir looks the very specter of death, mixed with a bit of Carnevale de Venezia panache. He fits in wonderfully well with my favourite of the Freeooter's Fate faction, the Brotherhood. He might not be as regal as the Queen of Shadows or as sleek as some of the others, but his rough exterior and grim vibe make him stand out amongst his peers. I might not have got the best out of him so far in my games of Freebooter's Fate, but that's mainly because I've positioned him poorly and used him badly. Despite this he's always done well for me whenever I've used him. So God only knows what sort of damage I can do with this beast once I start using him properly, and stop deploying him like I'm an idiot!!! For those of you who don't play Freebooter's Fate it's still a really nice characterful model to paint. Peace out! Hmmm, stilts. I wonder if they've been influenced by Tim Powers' "The Anubis Gates"? You know what, I'm ashamed to admit it but I've never got round to reading The Anubis Gates. It's sitting on a book shelf back at my parents house. Every time I plan to pick it up and read something else always got in the way. So I couldn't say, I know of some of the more popular characters though like Horrabin the clown, who I take it you are referring to with the 'stilts'. If so I'm guessing the answer is possibly. I definitly recomend picking it up soon. Its a splendid read. I think the upcoming new crew could have even more of an "Anubis Gates" feel to it. What do you know of the new faction then? Spill the beans!!! The whole Brotherhood range is exceptional, to say the least. Too bad for me that the lady of the house called dibs on them; sigh. Also, she says that Miedo a Morir means "fear of death" / "scared of death" in Spanish, so you were correct. Mi español es malo. Muy, muy mal! Indeed the whole Brotherhood range is truly exceptional, and Miedo a Morir is arguably the best of the bunch currently. I know he's one of the older Freebooter's Fate miniatures, but I felt he needed highlighting again. Just lovely. Thanks for the review. It's indeed a beautiful model. Freebooter's Fate has pretty much been on hold lately. But Warhammer Fantasy recently got a big blow with a dear friend. Might be a good time to try and get 2 starters ready. To fill that fantasy gap. It's such a nice streamlined fun game. Then after about 15 to 20 games you realise just how subtle and in-depth the tactics actually are. Freebooter's Fate deserves to be far more successful and popular than it is. Just brilliant. That might be what I need right now. Could you tell me how many points a normal size game is? Read the review you lazy sod!!! Oh OK as it's you. I'd sya start around the 300 doubloons mark and work your way up to 500 doubloons. I think it's most fun around 500 doubloons as both sides get enough 'toys' to make games tactical and fun. Hmmm, I could have sworn there were no recommended point values in there.. Awkward! Second line in First paragraph of the gameplay section!!! I just checked to make sure. It'd be unlike me to review a game and not suggest a points value, or say what a typical points value for any given game is. But indeed, it would be very unlike you. That's so not bloody likely!!! Don't mock the man-flu! That thing is deadly I tell you! All those womenfolk are very lucky they are spared that particular agony..
Freebooter's Fate rocks. Miedo is definitely one of my favorite miniatures. My jaw literally dropped the first time I saw him. Wow, I love the cloak! If you don't mind, how did you do that? I wholeheartedly concur with A_G, that's a lovely paint job you've done their Mike. I'd advise peeps to go take a look. Do you have a link to a guide or stuff on your Blog? Thanks a bunch, folks! I'm grateful for the compliments. Well happy coincidence, accident or whatever, it's a nice paint job and you should be proud of it buddy. Oh, I forgot to answer your other question. As it turns out, I just started a blog a week or so ago. Here's the link to the first post, where I introduce it and where I provide links to my painting WIP journals on WAMP.